Paisley Easton watches her footing as she makes her way along the rocky shoreline of a natural spring. Her blonde hair falls in waves over the white robe that wraps her petite body. As she closes in on the water, she slips off her flip flops, and her manager pops open an umbrella. That’s one of the first rules of being a mermaid: Never let anyone see you transform. Soon, Easton emerges, now a mermaid clad in a pink-scaled tail and a pearlescent bikini top. Her manager sweeps Easton up in her arms and places her on the algae-spotted rocks of a miniature waterfall that spills fresh water. Easton takes direction from the photographer. Toes pointed so the pink tail fans out. Back positioned just right. Smile, but not too much. Blonde beach waves pulled to the front for full mermaid effect. Easton is a mermaid trainee. Today, after her promotional photoshoot is over, she’ll swim her fifth and sixth shows at Weeki Wachee Springs State Park, a Florida roadside attraction that features natural springs, boat tours and its famous mermaids. In 1946, WWII Navy veteran Newton Perry surveyed spots that would become home to his new business idea. On the side of U.S. 19 — then a two-lane dirt road, now a traffic-packed six-lane highway — Perry stumbled across a natural spring. It was full of refrigerators, abandoned cars, trash… everything except clean water. And, according to the state park, more alligators and black bears roamed the area than humans. But Perry saw potential for a roadside attraction. First, he cleared the spring. Then he channeled his experience as a Navy “frogman” trainer, when he taught men to swim underwater during WWII, and tinkered with a new underwater breathing apparatus. It was a long hose fueled by an air compressor, and it could supply air to humans while underwater — no bulky scuba tank required. This way people — or mermaids — could hang out underwater. In 1947, the destination opened for business. Mermaids attracted passersby much like teens lure customers into a car wash today — by standing on the side of the road and waving. (The bikinis probably didn’t hurt either.) Then, they’d dive into the spring and perform their synchronized routine as they effortlessly gulped breaths of air from Perry’s self-regulated hose. Weeki Wachee soon became one of the most popular tourist destinations in the U.S., according to the state park. Remember, this was 24 years before the opening of Disney World in Orlando. After Easton’s morning photoshoot, she walks back to the “mermaid villa” where her cohorts trickle in and begin preparing for their 11 a.m. show, the first of four that day. The lights around the makeup mirrors illuminate their faces as they lean toward them. Bags and binders of makeup — primer, waterproof mascara and lipstick — line the tables. Some of the women pair up to pluck eyebrows while others layer on their makeup and chat with each other. Kristy Madden, 23, sits towards the end of the table. She’s been a mermaid for four and a half years now. She’s pulled her thick blonde curls halfway back as she applies foundation. Madden grew up visiting Weeki Wachee with her family, “but I never saw [the mermaids] as real people,” she says, laughing at the irony. Next to her is Cheyenne Bragg, who’s 21 and has been a mermaid for more than two years. Her bright blue eyes pop against her tanned skin. Before becoming a mermaid, Bragg was a lifeguard at Buccaneer Bay, the roped-off swimming area adjacent to the mermaids’ underwater stage. Bragg always observed the mermaids from her perch, but, for the longest time, she never considered becoming one. Both Madden and Bragg are nursing students at Pasco-Hernando State College. For them, being a mermaid is the perfect job because it offers a flexible schedule. They use their income — mermaids’ pay starts around $10 an hour — to pay off bills, like car payments and student loans. Fully transforming into a mermaid can take up to a year. First, aspiring mermaids show up to open tryouts, which occur about once a year, or as needed. To qualify, the women (or men, if they’re princes) must be at least 18 years old and be able to swim 400 yards in under 15 minutes, which proves to be a challenge. It took Bragg two tries to pass the test. After qualifying, there’s training. An important part of that is becoming scuba certified so the mermaids know how to use the air hoses and understand safety protocols. The mermaids also have to learn how to use buoyancy to their advantages. A deep breath in allows them to float up. Let it out, and they’ll sink down. But training is just the start — mermaids must master the underwater routines. Madden and Bragg agree the Ferris wheel is the most difficult move. For this move, the women drop their hoses, grab each other’s tails and create something like a Ferris wheel as they swim in a loop. Even though it’s a short amount of time, the mermaids exert a ton of energy. Bragg struggled to hold her breath for so long at first. “At one point someone asked if I smoke cigarettes,” Bragg says with a laugh. And because this is a natural spring, there’s a current, which can move up to 5 mph. The mermaids have to exert additional energy to stay in place. Also consider the water temperature: a brisk 74 degrees year round. Some mermaids emerge from the water shaking uncontrollably after a show. They’re whisked away into the “hot room” so their body temperatures can stabilize. But even through the difficult physical work, each mermaid said they love their job, especially the sisterhood bonds they’ve formed. On land, they travel together and make appearances across the country (including on stage at a Jimmy Buffet concert). In the water, they spend hours practicing and performing. They have to have each other’s backs in case anything goes wrong. Kelley Madden, left, and Brittany Fussell get ready to dive into “the tube” that leads the mermaids into the open spring. It’s warm in here — we estimated it’s about 85 degrees — which helps the tails dry more quickly (because what would be more miserable than shimmying on a wet tail?) and helps normalize the mermaids’ body temperatures after each 30-minute show. Paired with a sequined bikini top, most of the women choose to wear a plain bikini bottom. Some choose to wear tights underneath; they say that helps with the whole mermaid-tail friction issue. Once ready, the women file down a narrow spiral staircase. This leads to the “tube room,” which features a giant pothole — or “the tube” — that leads the mermaids into the open spring. The more experienced “full-fledged mermaids” perch on the side of the tube, slide on their snorkeling fins, then inch on their tails. That’s what Victoria Cox does. “All right,” she says. “See you in a second, Paisley!” She shakes her head, likely bracing for the impact of the cold water and hoists herself off the side. Cox swims straight down a 16-foot tunnel that’s about six feet wide, then she turns and continues into another tunnel, this one four times as long as the first. Once in the open natural spring, she finds the airlock, a small underwater chamber where she can stand in waist-deep water out of view from the audience until the show begins. She’ll return here during certain points of the show, too. Back on the other side, Easton prepares to hop in next. Before positioning herself at the edge of the tube, she grabs a piece of white bread from the nearby shelves. She molds it in her hands before stuffing it in her bikini top. The bread will be handy during the show, when she’s summoning the fish. Because Easton is a less experienced mermaid, she ties her tail around her waist and hoists herself down the narrow ladder that leads into the tube then pushes herself off into the water. In she goes to join Cox in the airlock, which is where she pulls on her tail. She’ll do this until she becomes comfortable enough to jump right in. Just on the other side of the hot room is the air-conditioned 450-seat amphitheater (an upgrade from Perry’s time). It’s packed. Kids scramble around the benches and chatter as they wait for the mermaids to appear. 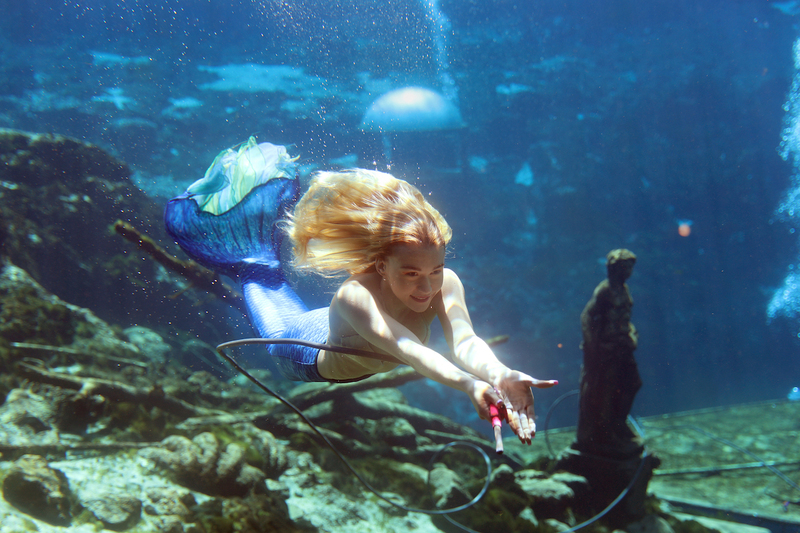 Then, a voice comes over the loudspeaker and welcomes the guests to Weeki Wachee’s historic mermaid show. The voice belongs to Victoria Vernon, another mermaid. She’s tucked away in the control booth and is the director of this morning’s show. Vernon isn’t the only mermaid to take on multiple jobs throughout the day. Typically, six to eight mermaids swim in a show. But Weeki Wachee has a roster of 25. Those who are working but not swimming will act as greeters, ushers, launderers, seamstresses, cleaners, lifeguards and, in Vernon’s case today, show directors. Vernon sits in what looks like the cockpit of a submarine. She has a clear view of the underwater stage and the mermaids. She cues the music for each routine, which the mermaids can hear underwater, and even talks to them. “The audience is loving it,” she says at one point when she hears kids go ballistic on the other side of the door. In the water, the mermaids carry on. This morning’s show is the tale of “The Little Mermaid,” who is played by Stayce McConnell. She’s been a mermaid at Weeki Wachee for about 15 years, but today, as the Little Mermaid, she’s celebrating her 15th birthday. Her mermaid friends dance around and celebrate with Chester the Turtle and the fish, lured in with Easton’s bread. They do two Ferris wheels and blow kisses to the audience. Throughout the entirety of the 30-minute show, the mermaids smile and keep their eyes wide open. They use the music from the underwater speakers to lip-sync. After the show, a curtain closes. The audience exits. When the last member saunters out, the curtains go back up. It’s time to clean. Vernon flips on some tunes by country duo Florida Georgia Line. The women strip off their tails and start scrubbing the underwater stage, which is full of fish poop and algae. They use a brush to shine up the fixated shells and clean the amphitheater’s windows. When the job is done, they each swim up into the tube room. The acting lifeguard announces over walkie-talkie when each one emerges: Victoria is out, Paisley is out, Cheyenne is good. Once each mermaid is accounted for, the safety gate latches over the tube… until the second show of the day — and the third and the fourth. Later that night, after they’ve hung up their tails to dry, the group will gather at the nearby Chili’s Grill & Bar to send off Whitney Roberts. Roberts has been a mermaid for four years now. She’s recently graduated from the University of South Florida, and now she’s shedding her tail and starting her life on land, as a leasing consultant in New Orleans. But she’ll always be one of the lucky few who got to be a real-life mermaid. Carson Kohler (@CarsonKohler) is a junior writer at The Penny Hoarder. She grew up admiring the mythical Weeki Wachee mermaids, even though she never wanted to be one herself.